Ther Black & Blood Buzzer may look a bit gaudy at the vice or in the flybox, but when the thorax is wet it turns a beautiful blood red colour. It is important to pick out the fibres around the thorax to create a scruffy look. Thread : Sparton Professional, black. Rib : Fine red holographic tinsel. Abdomen : Sparton Professional, black and coated with epoxy resin. Breathers : White siliconised polypropylene yarn. Thorax : 50/50 mix of purple and red fine dubbing. 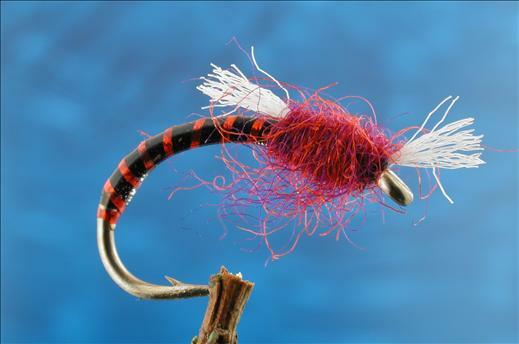 Currently there are no comments about the Black & Blood Buzzer fly pattern from other fly fishermen yet.